We’d love your help. Let us know what’s wrong with this preview of A Tale of Two Houses by Susan Harris. 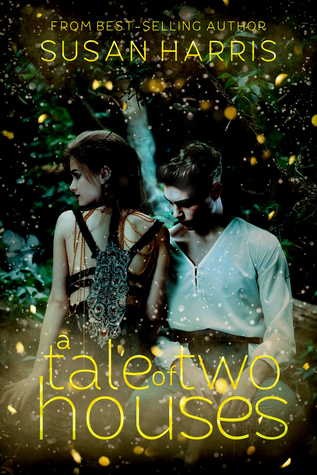 To ask other readers questions about A Tale of Two Houses, please sign up. This was promoted as a reimagining of Romeo and Juliet but it's much more than juat the same story with a few slight changes. Susan Harris took the story of forbidden love woven by Shakespeare and added aspects to the mix that you never knew could fit. Magic? Oh yes, trust me when I say you need to read this. I'd really like to add more but don't want to spoil it for anyone. There's original characters and a plot twist that will have you purchasing the second in this series before you even finif This was promoted as a reimagining of Romeo and Juliet but it's much more than juat the same story with a few slight changes. Susan Harris took the story of forbidden love woven by Shakespeare and added aspects to the mix that you never knew could fit. Magic? Oh yes, trust me when I say you need to read this. I'd really like to add more but don't want to spoil it for anyone. There's original characters and a plot twist that will have you purchasing the second in this series before you even finifh the first one. This was promoted as a reimagining of Romeo and Juliet but it's much more that just the same story with a few slight changes. Susan Harris took the story of forbidden love woven by Shakespeare and added aspects to the mix that you never knew could fit. Magic? Oh yes, trust me when I say you need to read this. I'd really like to add more but don't want to spoil it for anyone. There's original characters and plot twists that will have you purchasing the second in the series before you even finish this one.